Who doesn’t love to have testimonials on their site right?! The built in testimonials module for Divi is great but lacks in a key area.. it has to be repeatedly added on each page you’d like it to appear on meaning a lot of typing and copying and pasting. 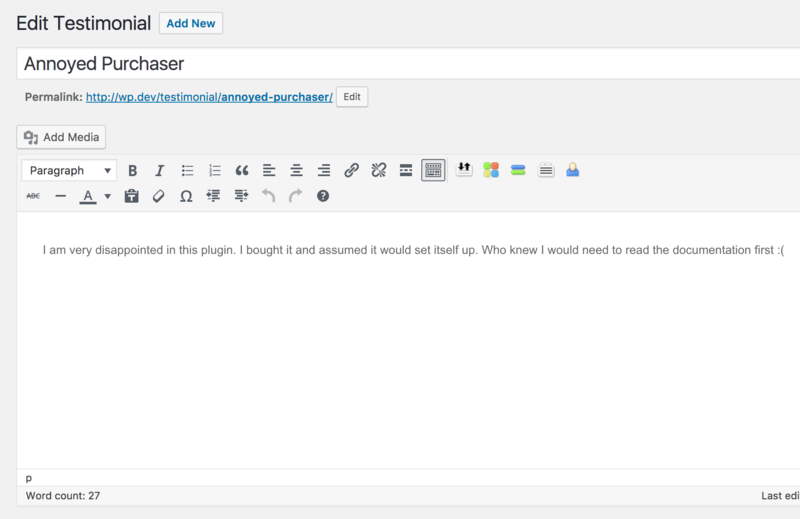 Then if you need to remove a testimonial it means editing each page again to remove the content. Data/Testimonial management is VERY cumbersome indeed. This plugin is a companion to the popular Slick Slider/Carousel Module for Divi and provides a central location for you to enter and categorise your testimonial content. You can then use the power of the Slick Slider/Carousel to present that content around your site. The beauty of this configuration is that you manage your testimonials CENTRALLY on a single and familiar admin page. Each testimonial can have a title, content and image and be presented any way you choose using the innovative Loop Archive Module provided. 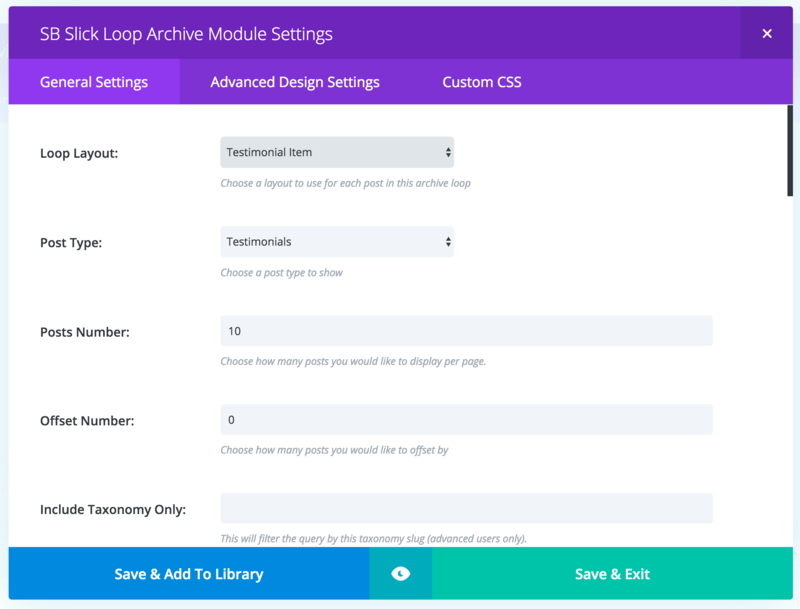 This, simply put, means that you create a layout and style it as much as you like in the divi builder for a single testimonial slider item and then use the loop archive module to create a slider of those layouts to suit. It’s a very clean and extensible system. 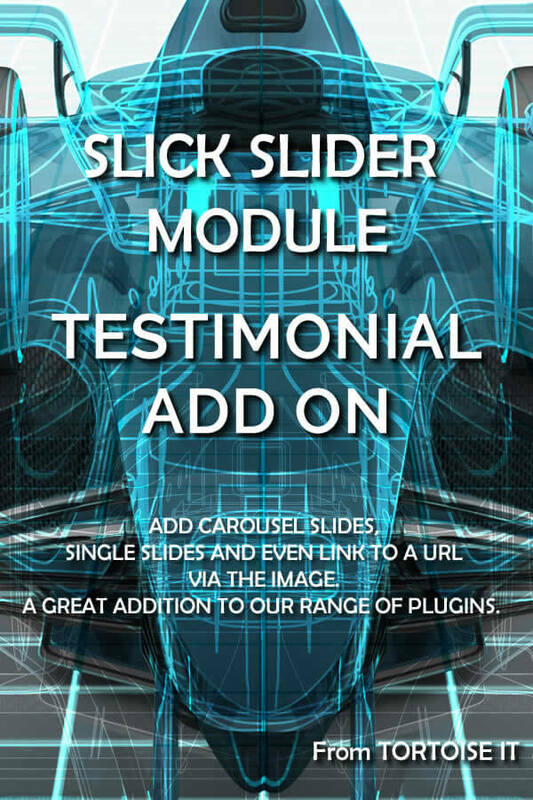 Please watch the video which shows and explains how to use this plugin and the Slick Slider/Carousel module to make beautiful and incredibly low maintenance testimonials to suit any site you’re working on! Download both ZIP files bundled with this plugin. Both are plugins. Set the post type to ‘testimonial’ and the loop layout to the one you just made above. My examples in the video took no more than 5 minutes from activation to publish to use. I am not a graphic designer but have created a basic example (see video and screenshots) for you to see and hopefully give you an idea of how to use this. I shall be extending the plugin a lot over the next few weeks to include more custom fields for the likes of a rating, front end submission and a variety of predefined styles. Where is the video to created the loop layout? The “Testimonial Item” Divi layout is nowhere to be found… tried installing on more than one site and nothing…any ideas? You need to create it. Did you watch the video which explains it?